The Egyptians believed that preserving the body in death by the process of mummification was important to keep their soul alive - without a physical body the soul had no place to dwell and became restless forever. The Ancient Egyptian death masks were used to cover the face of mummies and ensure that the spirit of the dead person was able to recognize the body. Royal death masks or burial masks, such as the fabulous Golden Death Mask of Tutankhamun, King Tut, were made of gold in the image of the deceased. Egyptian Gold was believed to have a magical potency and believed to contain significant religious properties. Gold did not tarnish or deteriorate. But more importantly, gold shone like the sun god Ra (Atum) and was therefore credited with the powers of the sun god. 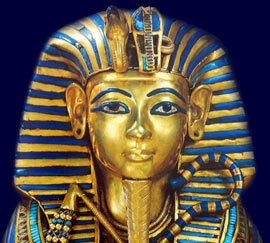 Other death masks, or burial masks, were made of linen or papyrus and painted to look like gold. The purpose of the death masks, or burial masks, was to provide the dead with a face in the afterlife. Death masks were made for both Egyptian men and women. The Ancient Egyptians also made use of masks during sacred ceremonies and rituals. The religion of the Ancient Egyptians was extremely important to them and touched every aspect of their life. Temples were believed to be the dwelling places of the gods and the statues of the gods were believed to be the embodiment of the god, hence the offerings of food and drink. Their religion was surrounded by mystery - only priests and the Pharaoh were allowed into the temples. Their religion was also surrounded by magic and the use of spells. Their vision of the Underworld was terrifying. Their need to enter the eternal afterlife was paramount. Egyptian masks were used during sacred ceremonies and rituals and increased the levels of mystic and fear which surrounded their religion. The Death rituals of the Egyptians included a priest wearing a mask of the jackal headed god Anubis. Other masks, mirroring the images of other gods and goddesses, were also used in rituals involving magic, spells and incantations. The Death rituals of the Egyptians included a priest wearing a mask of the jackal headed god Anubis. These masks were large, being taller than the head of the wearer. They were worn over the head and covered part of the shoulders of the priest. The snout and raised ears of the jackal head towered over the priests head. The priest who wore the Anubis mask had restricted vision through two small holes which were located on the neck area of the mask. The effect of these ritual masks created a daunting illusion of Anubis.